When working underground, the need for a cap lamp is undisputed; eyes alone can’t ensure clear visibility and safe operations below ground. At the same time, this essential element in personal protective equipment (PPE) hasn’t gone through any major changes in almost a decade. According to engineering manager of MineARC Systems, Daragh Quinn, the cap lamp industry has been stagnant for the past eight years – the last major development in the market was the transition from an incandescent light bulb to LED lighting. Since then, all the cap lamps that have been available for the industry have been geared towards the same design philosophy: to provide a narrow beam of intense lighting. “All cap lamps focus on a very specific type of light. They all have a strong focused beam. However, what we were finding was there wasn’t a lamp that could give us a nice, wide illumination of your surroundings,” Quinn says. These cap lamps project only a narrow, strong pencil beam that helps visibility into the far distance, but not comfortably as users look down at their feet. “You’re trying to find a tool in your tool bag, but the light on your cap lamp is very intense. It reflects a lot of light back at you and when you look up, your eyes need to take a little while to refocus,” Quinn says. 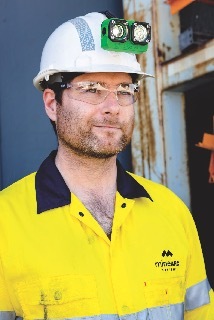 As intense lighting isn’t necessarily useful, the team at MineARC created the SiriUS cap lamp on the premise of improving the eye comfort of underground workers. SiriUS activates two different lenses and LED lights at the same time. This ensures the projection of a more natural light. A narrow beam delivers focus, while a wide beam provides a more dispersed, farther-reaching flood light. The lamp also features an automatic light adjustment that allows for automatic dimming when in contact with ambient light intensity, aimed to mimic natural daylight as closely as possible. It ensures eye comfort when looking directly at a co-worker during group situations and reduces any safety concerns associated with the startling glare of high beam in the eyes, including that of other lamps. Workers can also switch to a turbo mode to activate high intensity LED light, which can last for a short period of time without completely draining the battery. While consistent lighting in a wide beam or high spot mode can last for 18 hours, a low power mode makes sure the cap lamp keeps going for another two hours – more than enough time for a worker to swap over to a fully charged battery. Other battery packs can also be kept on hand, with one connected to the cap lamp through coils that hug close to the body, preventing them from getting snagged while a worker is on the move. “Additionally, tracking is becoming something that’s required in a lot of cap lamps, so we’ve made that functionality available, depending on the requirement of mine sites,” Quinn says. The global leader in safety technology incorporates RFID tagging and its own GuardIAN Tracking software in the SiriUS cap lamp. The GuardIAN software allows wearers to be tracked remotely from the site’s control room, providing vital information for search and rescue teams in an emergency situation. “The cap lamp isn’t tracking you, but it has the ability to be tracked,” Quinn says. “When you’re going to a dangerous area, someone can alert you and tell you that you’re stepping into a dangerous zone. The article also appears in the Apr-Jun 2019 edition of Safe to Work.